BP has just announced that the company has already spent $1.25 billion in the containment efforts and environmental cleanup operations, and it is widely expected that this number will more than triple by the time it’s all over. BP continues to take every measure possible in stopping the gushing oil leak from their pipe in the Gulf of Mexico. However, their efforts both on land in environmental cleanup and in the ocean trying to cap the leak is costing BP literally billions of dollars. The current cost to BP for this gushing pipe in the Gulf is $1.25 billion dollars. That’s an expensive oil leak, to say the least. Not to mention the cost in lives from the oil rig explosion – something that simply cannot be measured monetarily. At some point, the BP oil pipe disaster has to take a toll on the BP stock price, credit worthiness, and all the other factors that go into valuation as a company and their publicly traded shares. 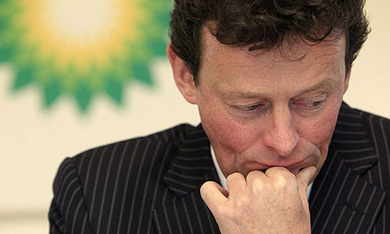 And certainly BP shareholders have to start getting nervous about the current status of the disaster. They did it, they pay for it. I believe the world, and life itself is worth way more than 1.25 billion dollars. When the BP Gas Card comes in the mail, it has to be paid by a certain date, or there are monetary penalties. They want you to pay, we want them to pay!!!! I beleive BP did not want this to happen and will do right by it. I also beleive that if government regulations were not so strict on oil companies, they would not have to drill so far offshore and the chanches of accidents like this would not be as likely to happen. I before E, Belief is for faith and where capitalism prevails the only truism is the pursuit of profit. Google search Baku if you want to see unimpeded access or the Indonesian mudflow to prove that accidents still occur on land. Sadly, only the threat of severe financial consequence will tighten industry practice. with a thought process like that, you must be american. just fix the mother f**king pipe! who cares`how much it costs! its going to cost us all our lives if it dont stop soon! its already taken how many lives! what about the saecreatures lives the land animals lives? fix it now! the perdictions are right! armegeddon is nearing, and the more thousands of gallons pooring into the ocean eeveryday is just pushing it closer and closer as we just watch it happen! Why are there not more efforts to use natural elements to clean up the spill? There are microbes that can be used to clean this mess up, hay can be used as well. Instead they are spraying more chemicals that are increasing toxic risk to sea animals, fish, and human lives. I sincerely fear the outcome in regard to this. Watch the youtube video about using microbes to clean up oil spills. Our nations needs to come together and demand other options be used in place of chemicals that BP is using. BP is using their chemicals and making money off of the "top kill" they are using! Enough is enough! "Company [BP] Believes a Bigger Cap Will "Provide a Better, Tighter Fit" over Oil Well Blowout at the Bottom of the Gulf of Mexico"
it's (exactly) MY IDEA published June 6 on my blog and posted hundreds times (or sent via email with the text below) on several blogs everywhere on the Web… CBS, CNN, DHR Facebook Page, BBC, Huffington Post, WSJ, Blooomberg, NYT, BusinessWeek, Washington Post, Los Angeles Times, etc. etc. etc. the BP's "cap" CLEARLY is a DRAMATICALLY WRONG idea!!! don't wait more DAYS or WEEKS to do something better!!! take a look and adopt NOW my NEW idea just published!!! it can STOP up to 100% of the leak in a matter of days!!! This should be a bigger story then it is. We need Obama to earn his keep and get this cleaned up in a hurry. BP owes the people of southern United States billions at least. Not to mention the environmental impact this spill has had already. RIP the victims killed and all due respect to their families. BP make it right. I am sorry for the eleven Lives Lost. I am sorry I am so selfish as to want my life back when so many have died. I am sorry for the trillions of creatures who I have killed with my carelessness. I am so sorry for what I have done and will devote the rest of my life and monetary resourses to fixing this. God please help me in my task . I am truely sorry and will prove that by my unceasing and tireless effort for the rest of my life. I must show by my actions that I am sorry and not think about my own personal goals and benefits. This is what I must do. It will be my lifes work. Anything less is just lip and ceo baloney. Obamie is jumping on the it will be alright train too. This is one of the largest man made disaster ever to hit the earth. We are some dam smart we think. Well we are not. We really need to look at what we are doing. Much more carefully to space ship called earth. If we make too many more mistake the consquences will be just terrible. As it is this is beyond what anyone thinks.